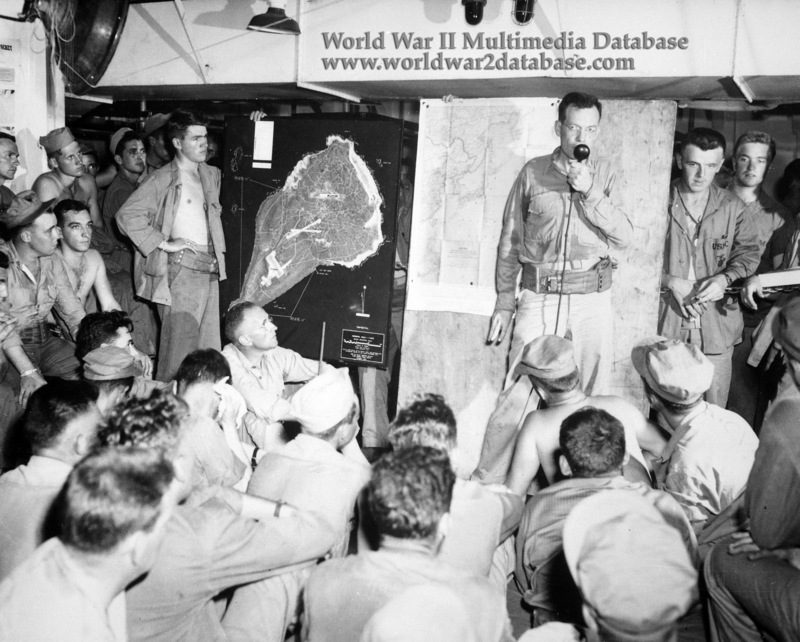 Lieutenant Wade briefs 4th Marine Division platoon about landing on Blue or Yellow beaches on D-Day. Note relief map behind him and maps of the Pacific. The 4th Marine Division was designated Landing Group Baker (Task Group 56.2.2). Transported to Iwo Jima by Transport Squadron 15 (Task Group 53.2) under the command of Commodore H.C. Flanagan. Transport Squardon 15 consisted of ten attack transports (APAs); four attack cargo ships (AKAs) and one vehicle landing ship (LSV) just for the 4th Marine Division alone. After the battle, the number of unwounded Marines for the entire operation only required eight transport ships.